With all the blessings our modern age has given to us, let us not give up the things that promote the workings of the Holy Ghost. It has been more than 50 years, but I vividly remember Christmas morning 1959. With childish anticipation, I hoped desperately for a new bicycle. My older brother and sister and I shared the same bicycle, a 24-inch (61 cm) antique we had each used to learn to ride. It had long been less than stylish, and I had appealed to my parents for a new bicycle. Looking back, I am a little embarrassed that I did not have more sensitivity to the cost of such a present to a family with limited income. Christmas morning came, and I leaped up the stairs from our basement bedroom. Running into the living room, I looked in vain for a bicycle. My heart dropped as I noticed a small present under my stocking, and I tried to control my disappointment. As we sat as a family in the living room, my father asked me to get a knife from the adjoining kitchen so we could open a box holding a present for my brother. I walked into the small kitchen and fumbled for the light switch to find my way. As the light illuminated the room, my excitement soared. Right before me stood a beautiful black 26-inch (66 cm) bicycle! For many years I rode that bicycle, took care of it, watched over it, and befriended it﻿—a gift long appreciated and treasured. Just three months before that Christmas, I had been given another gift far more important and consequential than a bicycle. I had been baptized and given the gift of the Holy Ghost. In those early years and perhaps too often in the many years since then, I was like the Lamanites the Savior described as being “baptized with fire and with the Holy Ghost, and they knew it not” (3 Nephi 9:20). Jesus stressed the incalculable value of baptism and the gift of the Holy Ghost: “Verily, verily, I say unto thee, Except a man be born of water and of the Spirit, he cannot enter into the kingdom of God” (John 3:5). And to ease the difficulty of His announcement to His disciples that He would shortly leave them, the Savior promised this heavenly gift: “I will send him [the Comforter] unto you” (John 16:7). This is a gift of enormous power. From the scriptures we learn what this gift will bring to those who eagerly receive it: “The Holy Ghost … beareth record of the Father and of the Son” (D&C 20:27; see also 1 Corinthians 12:3; 3 Nephi 28:11; D&C 42:17). The Holy Ghost teaches us all things and brings all things to our remembrance (see John 14:26). He guides us to truth and shows us things to come (see John 16:13). He enlightens our mind and fills our soul with joy (see D&C 11:13). By His power we may know the truth of all things (see Moroni 10:5). He will unfold the mysteries of God unto us (see 1 Nephi 10:19). He shows us what we should do (see 1 Nephi 4:6; D&C 8:2). He inspires those we teach (see 2 Nephi 33:1). More important, the remission of sins comes through the Atonement “by baptism, and by fire, yea, even the Holy Ghost” (D&C 19:31; see also 2 Nephi 31:17), allowing us finally to be sanctified by this gift and to stand spotless before Christ at the last day (see 3 Nephi 27:20). This gift of the constant companionship of the Holy Ghost is available only to those who have been baptized and confirmed members of The Church of Jesus Christ of Latter-day Saints.1 The Holy Ghost can influence at times all seekers of truth, but the gift of the Holy Ghost is reserved in its fulness for those who have taken upon themselves the covenants of the restored gospel.2 This gift is real. It is a supernal blessing to members of the Church. We live in a time when transportation, communication, and access to information all tower in comparison to the past. But moral issues such as honesty, chastity, Sabbath observance, family responsibility, and even the sanctity of life﻿—issues long held in unison by the world and by Latter-day Saints﻿—now find themselves interpreted in every way and open to debate (see D&C 1:16). How can we use this heavenly gift as a vital compass for our daily actions? We must believe that even in our weaknesses, the still, small voice we feel comes from our Father. We must pray and ask and seek and then not be afraid when answers come into our heart and mind. Believe they are divine. They are. Believing that revelation will come to you as well as to others is keeping your heart open to conviction. Examples of how the Holy Ghost works daily in the lives of members of the Church are numerous and inspirational. Most are quiet and personal, seen only as dramatic when we look back at the changes they brought. Think of your own experiences as you read a sampling of experiences that have been shared with me. A woman had been thinking about some of the job options she might pursue as her children returned to school. As she sat in sacrament meeting, the stake president stood to bear his testimony. He read a scripture: “Seek not after riches nor the vain things of this world; for behold, you cannot carry them with you” (Alma 39:14). That verse sank deep into her heart that Sabbath day as a spiritual confirmation of the things she should pursue during the coming year. A young college student far from home had begun to feel terribly alone. She pleaded in her prayers that she might receive help in her crisis. One morning in class, she felt an extraordinary feeling of comfort. A thought came into her mind: “You are never alone.” Her prayers were answered, and her feeling of homesickness was gone. We live in an age when the most corrosive elements of evil surround us. Communication technology, which brings many wonderful things into our lives, also invades our communities﻿—and even our homes if we are not careful﻿—with that which can quickly numb us to the gift of the Holy Ghost. We must be vigilant as to what we allow to influence our spirits. If you want greater clarity in understanding and believing the still, small voice, there is no better medicine than greater obedience. Jesus said unto His disciples, “If any man will come after me, let him deny himself, and take up his cross, and follow me” (Matthew 16:24). I have thought at times how different my children’s lives are from my own growing up on a small family farm in southern Idaho in the 1950s and 1960s. Long days building a fence with my father, silent hours of moving irrigation pipe in potato fields, a home with one television that received only three channels, no computer, no MP3s, no mobile phones, few trips beyond nearby towns, few distractions, and much time with family﻿—these were the building blocks of many of my generation. In today’s world we must provide quiet, reflective times for our children and teach them how to listen to the still, small voice. With all the blessings our modern age has given to us, let us not give up the things that promote the workings of the Holy Ghost: time alone to pray, ponder, meditate, and read the scriptures; and time with family undisturbed by noise, distractions, and too many activities. By following the feelings that come to us, we learn to trust that they do come from our Father. We “grow up” (D&C 109:15) in learning to discern this voice. President Monson then shared an experience about a friend named Stan, whose illness had left him partially paralyzed. Despite the finest medical care and the prayers of family and friends, Stan remained confined to a bed and began to despair. The Lord, in speaking of His Second Coming, emphasized that the gift of the Holy Ghost must be powerfully active among His Saints: “For they that are wise and have received the truth, and have taken the Holy Spirit for their guide, and have not been deceived﻿—verily I say unto you, they shall not be hewn down and cast into the fire, but shall abide the day” (D&C 45:57). We live in a wonderful day of opportunity, learning, and prosperity. But with these wonders come also the degrading deceits of the adversary, trying to push their way into the fabric of our lives, even attempting to burrow into the safe refuge of our homes. If we will receive the Holy Ghost as our guide and be wise in knowing, guarding, and building upon this gift, we will not be deceived. And as evil increases in the world, there will be a compensating power of the gift of the Holy Ghost for the righteous. As we give greater care to this divine gift, we “shall abide the day” and again live with our Heavenly Father. See Teachings of Presidents of the Church: Wilford Woodruff (2004), 49. See Dallin H. Oaks, “Always Have His Spirit,” Ensign, Nov. 1996, 59–61. Teachings: Wilford Woodruff, 41, 51. Boyd K. Packer, “Reverence Invites Revelation,” Ensign, Nov. 1991, 23. Teachings of Presidents of the Church: Joseph Smith (2007), 98; emphasis added. 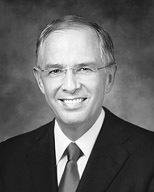 James E. Faust, “Voice of the Spirit,” Liahona and Ensign, June 2006, 6. Thomas S. Monson, “The Spirit Giveth Life,” Ensign, May 1985, 68, 70. As disciples of Christ, we must make the gift of the Holy Ghost a conscious, daily, prayerful part of our lives. In today’s world we must provide quiet, reflective times for our children and teach them how to listen to the still, small voice.